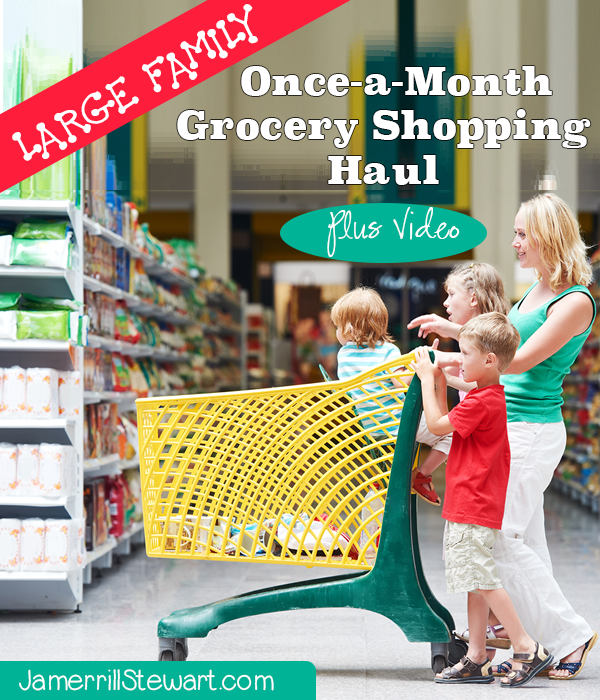 Click here to watch the full Once a Month Grocery Shopping Video! Isn’t this picture cute? It’s not me, or my kids, lol. In the next Once a Month Grocery Shopping Video I share the team work unloading, an overview of our grocery haul (including my fun Trim Healthy Mama finds! ), plus I go through several FAQs. One of the most common questions I get is how I make fruits and vegetables last all month. I answer that question and share a little more about our large family eating habits. I go into a few ways I feed the family with a Trim Health Mama flair, and how I adapt certain meals to make them THM friendly for me. Join me for all this and more in the Once a Month Grocery Shopping Unloading + FAQs Video. 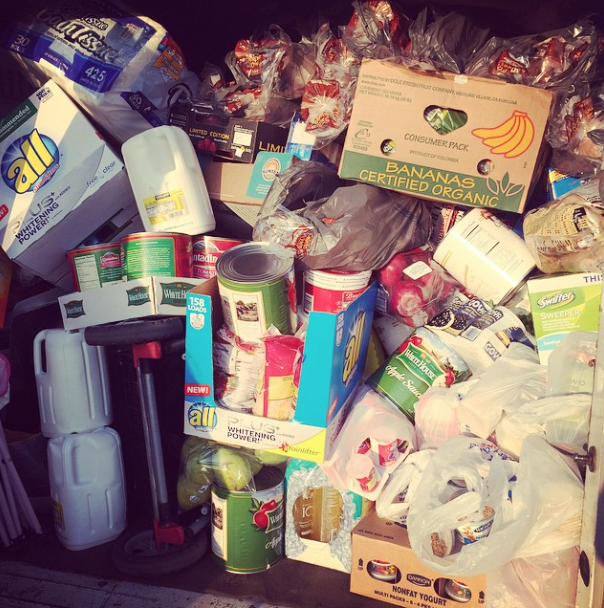 Click here to watch the full Once a Month Grocery Shopping Unloading + FAQs Video! Once-a-Month Grocery Shopping Haul + a Tour of my Refrigerators & Freezers! What are your grocery shopping tips and tricks? Love your videos! I have never commented here before, but have been reading for a couple of years. I have three kiddos and I homeschool, too. I am curious, what is your grocery budget? ( if that’s not too personal a question) We use the cash system as well and I just did my second once a month shopping trip at the end of April. I have ended up having to go back for fruits and veggies as I only have one fridge, but it is with cash from my budget, so I am okay with that. I LOVE watching your videos. The Lord has only blessed us with two boys, so I can’t identify with the large family parts, but I am so encouraged by your sweet, determined and encouraging words. It’s a blessing to see another momma in action. Thank you!!! We do a once a month shopping trip to get the main items for our dinners for the month and stock up on staples. I make weekly trips to our local discount grocery store for fruits, vegetables and any other good priced items I find. I also shop the lost leader sales each week. So it’s not truly once a month shopping but it helps to keep our grocery spending lower. Anything that helps is a blessing! Thanks for sharing your system. I just love grocery talk, lol! Hello! I’m wondering how you are able to get everything on your list or pick up extras at the store when you find deals on things, and still stay within your cash limit? I find that I just can’t stay within the budget most times, even with a meal plan and grocery list. Prices just seem to vary so much from trip to trip! I am very careful about planning for our family to eat, and when I say I go over budget it’s not completely blown out of the water or anything, but an extra $30 here or $40 there each time (sometimes more, sometimes less), really adds up. But anytime I try to cut back on certain foods or items, it just doesn’t last us like it should. Please help! Jessica, do you shop with cash? As in the green bills and not a debit card? I was forever going over $10 at this store, and $30 at that store, when I shopped with my debit card. Then through Dave Ramsey’s Financial Peace University my husband and I learned about an MIT study that showed something interesting; when you shop and make your purchases with cash it actually activates the pain receptors in your brain. When you shop with plastic, yes – even a plastic debit card, it does not stimulate the pain receptors. This means your brain actually FEELS something when you shop with cash. We’ve been doing a largely cash-based budget for about 3-years. On our grocery day I take out only the budgeted grocery cash and I spend only that cash. I feel dirty now when I use my debit card, ha! Dave Ramsey isn’t against the use of debit cards, but he does teach that we need to feel money again. When I shop with my debit card I don’t feel it and it’s easy for me to overspend. That being said that doesn’t mean I shop unwisely. I get a lot of the same items every month so I know what the price ballpark should be. I see when fruits and vegetables change seasonally so I shop largely from what’s in season. Right now strawberries are substantially lower so we’ve been enjoying a lot of strawberries. I watched milk get up to about $4 a gallon. Now for the last several months it’s down to around $2.59 a gallon. This means I’m picking up a few more gallons of milk right now because I know we always need milk and I see the savings value. The only store where I’ll find variable deals is Sharp Shopper. In the post above I share that in that store I have about $60 of “deal money.” Since they’re a grocery outlet I never know if they’ll have $2/$1 bagels or a case of something special. So I plan for part of my money in that store specifically to take advantage of their deals. I hope that helped some. To review 1.) I shop with cash 2.) I shop for the best value on what I need when I’m in the store. 3.) I stick to my list besides the small amount of “deal money” I have budgeted in.